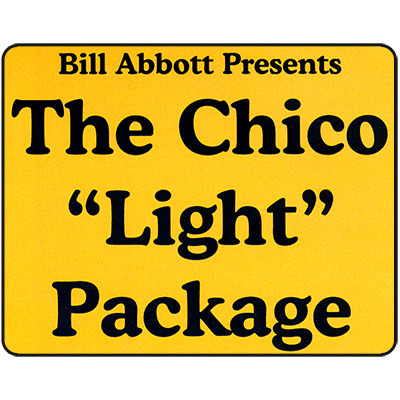 For the family show entertainer on a budget Chico the Mind Reader "Light" Package contains all of the professional instruction, full performances, practice poster and royalty-free music tracks minus the puppet and props. And you still get the complete hilarious show-stopping and solid laughed packed routine that packs small and plays big. With this single purchase plus a little leg-work to collect the props you will be adding 15+ minutes of solid entertainment to your show that can be learned in a short while, with everything you need to make it your own. What you are purchasing is a well-orchestrated and thoughtfully put-together professional package with built in laughs over years of refinement. Whether you adopt this routine as is, or inject your own personal touches, you will be receiving a truly perfect little piece of comedy, magic and theatre that appeals to a wide age range. Bill Abbott made an appearance with Chico on the "This is Daniel Cook" TV Show. Since it first appeared the episode has been airing consistently 3 and 4 times weekly on several Canadian networks, and was nominated for a Canadian Gemini Award for Best Performance in a Children's Series! The show was recently been purchased by Disney so you will see Bill & Chico on a Disney Channel near you.